The Supreme Court today issued notices to three lawyers Vikram Chauhan, Yashpal Singh and Om Sharma shown in a TV sting bragging about bashing up JNU case accused Kanhaiya Kumar and others on a petition filed by lawyer Kamini Jaiswal seeking initiation of contempt proceedings against them. 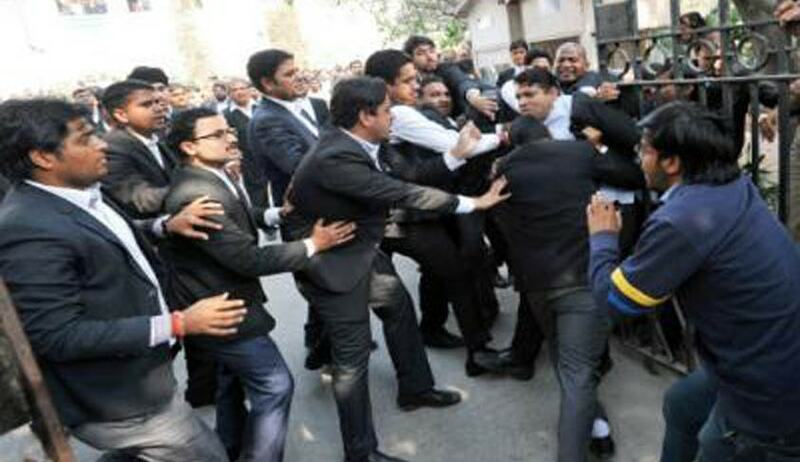 The court also issued notice to Delhi police and the Centre on the plea for setting up of a Special Investigation Team to probe the violence in the Patiala house court complex on 15th and 17th of February. A bench headed by Justice J Chelameswar sought replies from all parties by next Friday The petition filed by Jaiswal was argued by Advocate Prashant Bhushan.The petition accuses the lawyers of interfering with the administration of justice and for willfully violating the orders of the Supreme Court dated 17th of February. In the sting aired by TV channels the lawyers are purportedly seen admitting beating up JNU students’ union President Kanhaiya Kumar for around three hours when he was in police custody. Based on sting report and the report of the National Human Rights Commission, this is not an ordinary case”, Bhushan told the bench. In the sting operation, the two lawyers claim Kanhaiya wet his pants during the beating. “We thrashed him for three hours and we also forced him to say ‘Bharat Mata Ki Jai’. He later raised the slogan with us and we allowed him go,” Chauhan is seen saying. Singh also said they would beat him up again. “I will get a petrol bomb no matter what case is filed against me. I will not leave him even if I am charged with murder… I want to go to the same jail and will thrash him in his cell… I will not give my bail bond. I will go to prison for one or two days,” Singh claims in the tv video. The NHRC report also pulled up Delhi Police for “serious dereliction of duty” and said it “did not do anything to prevent the assault” on Kumar inside the Patiala House Court premises Wednesday or “apprehend the attackers”.